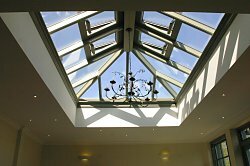 Mr and Mrs Glynn had previously benefited from a Heritage Conservatory in the year 2000 and were so impressed by all aspects of this project they instinctively rang again 6 years later for advice when considering purchasing a new home and wanting to add something similar. 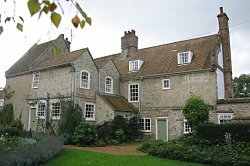 The new home proved to be a substantial Listed Building of historical significance needing a very sensitive approach. 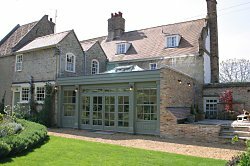 Not only did it require listed building approval and planning permission, but also building regulations due to its size and glazing requirements. 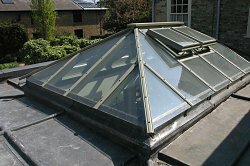 All of these elements were dealt with successfully by the Heritage Conservatories team and on the following pages you will see the results. It was decided the least impact and most use would be achieved by removing the external pantry and using the rear of the property as a kitchen/living area. The task was to overcome the physical hurdles of the site while creating a building of a sympathetic and substantial appearance. 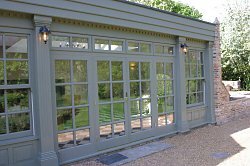 This was achieved by building a hardwood Orangery using chorded sliding sash windows from our conservation range. Small reclaimed bricks were used to replicate the side walls appearance and reclaimed coping stones were used to match the existing patio wall top. 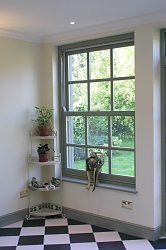 For Building Regulations the use of Pilkington ‘K’ double glazed sealed units in all the windows, doors and lantern was essential as was the highly insulated lead decks and high level of floor insulation used.